Sara has always loved writing, but she thought of herself as an artist first. After art school, she worked in fine art. She had a few shows, and also did some art writing and criticism for various magazines. Then, having taken the M Phil in Creative writing at Trinity College Dublin, she got published in the Stinging Fly, and after penning several short stories she won the won the prestigious Davy Byrne prize in 2014. She has now been shortlisted for the Hennessy prize. In 2011, Sara moved back to Cork with her boyfriend, an artist. Now working on her second novel, Sara thinks of herself as a practising artist. Date of birth: 5th May 1984 in Lancashire, but moved to Ireland soon afterwards. Education: St Mary’s High School, Midleton. Dun Laoghaire Institute of Art Design and Technology; Fine Art. Trinity College Dublin, MPhil in Creative Writing. Home: Whitegate, East Cork, on the coast. Family: Parents and sister. Dogs, Winkie and Zadie. The Day Job: Fulltime Writer. Favourite Writers: JD Salinger; WG Sebald; Virginia Woolf; Rebecca Solnit. The Debut: Spill, Simmer, Falter, Wither. Tramp Press: €12.00. A reclusive old man rescues a dog who is due to be put down. The two misfits soon build a bond, but when the dog gets into a vicious fight, and has, possibly, bitten a child, it’s time for the two to flee. What will happen when they return to face their demons? The Verdict: A strange but tender love story. 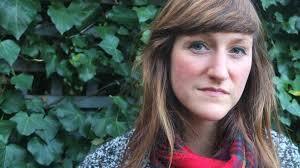 Sara Baume is a literary star in the making. Published in The Irish Examiner on 7th February, 2015.